Communities across the UK will benefit from greener journeys thanks to 263 new low emission buses, Minister Nusrat Ghani will announce today (Wednesday 6 February 2019). A £48 million investment from the Office for Low Emission Vehicles will fund new green vehicles and infrastructure to drive forward government plans to clean up the air in towns and cities. Visit the Ultra-Low Emission Bus Scheme winning bidders interactive map. Speaking at the UK Bus Summit this morning, the minister will also announce a new partnership with Greener Journeys to reflect the pivotal role played by the bus industry in tackling loneliness and social isolation. The partnership will see companies across the sector pledge to do all they can to tackle loneliness, including through innovative vehicle design and initiatives to encourage bus passengers to talk to each other. "Buses are far more than a way of getting from A to B. They are a crucial tool in the fight against loneliness and it is good to see the industry taking steps to tackle isolation. "This government is doing more than ever before to reduce emissions across all modes of transport and I’m delighted to see the bus industry putting itself at the forefront of this." This is the latest funding in a long line of investment designed to drive the uptake of zero emission vehicles, following the government’s £1.5 billion Road to Zero strategy published last year. In line with the Future of Mobility Grand Challenge - set out in the government’s modern Industrial Strategy - these measures chart a path for Britain to become a world leader in the zero-emission revolution, ensuring that the UK has cleaner air, a better environment and a stronger economy. But buses are not just about cleaning up the air in our towns and cities. As a key mode of transport for older and vulnerable people, buses play a vital role in facilitating social connections. The government also supports bus travel through a £250 million investment every year, as well as a further £1 billion for the free bus pass scheme, paving the way to a more sustainable future. 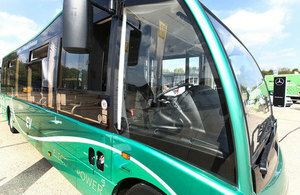 On top of this, there have already been several promising schemes launched by the bus sector, including Go Ahead Group’s ‘Chatty Bus’ campaign, encouraging conversations between passengers, and ‘Hattie,’ a community bus from Stagecoach specifically designed to provide a friendly environment where people can chat to others. "We’re delighted to be partnering with the government to tackle the epidemic of loneliness affecting millions of people in the UK. Research from Greener Journeys shows that a third of people in Britain go at least a day a week without speaking to anyone - not a friend, colleague or family member. "Buses play a vital role in facilitating social connections among the most vulnerable people, who rely on them to take them to visit friends and family. It’s fantastic to see the industry come together to launch such a brilliant range of initiatives to address the problem of loneliness." The Prime Minister launched the government’s first loneliness strategy in October 2018, as a vital first step in a national mission to end loneliness in our lifetimes. Loneliness is one of the greatest public health challenges of our time and the strategy, which responds to the findings of the Jo Cox Commission, sets out a range of initiatives to help all age groups build connections.